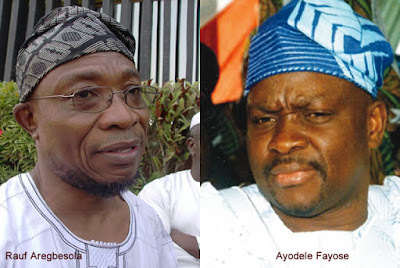 The All Progressives Congress in Ekiti State has raised an eyebrow over Osun State Governor Rauf Aregbesola’s visit to the Ekiti State Governor, Ayodele Fayose, in Ado Ekiti. The party argued that the visit to Ekiti was a slight on the APC and a contempt for the party’s leadership in the state. The governor at the event complained that the biting economic problem was such that in the whole of the South-West geopolitical zone, only Lagos State could stand on its own. He canvassed regional integration and cooperation as well as the revival of agriculture as some of the steps to ameliorate the situation. The APC expressed worry that Aregbesola at the event described Fayose as omoluabi and a hardworking governor who had turned around the fortunes of Ekiti State in terms of infrastructure. The state Publicity Secretary, Taiwo Olatunbosun, in a statement on Monday stressed that the visit showed contempt into which the party and its leaders were held by the Osun governor after Fayose had inflicted severe pains on the APC members, some of whom had been languishing in jail for about two years for the offences they did not commit.